David Duffy was awarded the Pacific Seabird Group’s Lifetime Achievement Award for his contributions to seabird management and conservation science. Users can filter by plant family or other traits and view the location and information for 1,054 arboretum accessions currently on the map. 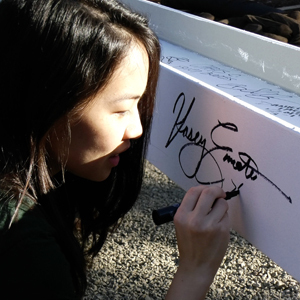 UH Mānoa students, administrators and officials signed their names on the final beam of the building’s steel structure before it was lifted into place. A team of scientists in the Department of Botany discovered a new species of leather mudweed. UH Mānoa researchers quantify social, ecological, and economic costs and benefits of alternative forest restoration strategies. The UH Manoa Biocultural Initiative of the Pacific is part of a $500,000 multi-university project that will explore how to make interdisciplinary research more effective and impactful. Scientists from UH Mānoa use new models to identify where forest conservation efforts will minimize human impacts offshore. UH Mānoa researchers were awarded $792,021 by the National Science Foundation to describe the new species of limu, or marine algae, from Hawaiʻi’s deep waters.